Ever notice how, even on rally's, we seem to always end up with hoods up somewhere in a parking lot talking about our cars and our experiences in them. Well we've finally decided to create an event that caters to that experience. It's the 1st Annual Chicago MINI Car Show at The Culvers Resturant in Buffalo Grove (rain or shine). This event is open to all club members and MINI owners thinking of joining our club. 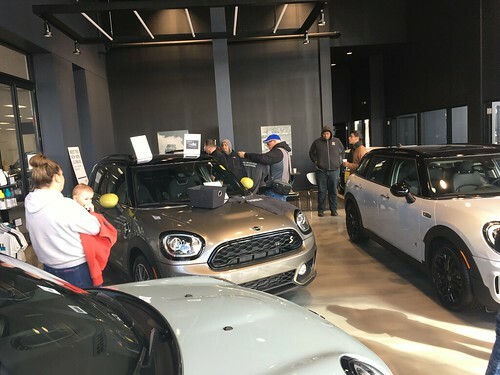 This is a chance to put your MINI on display. There is no entry fee. We have created some fun and not too serious categories for some “mini” prizes. The owners of the Buffalo Grove Culvers are advertising the MINI car show in their resturant so we hope to have a great response from the public as well. If you have ever thought of putting your MINI in a car show, this is your chance! This will be a great time to show off your MINI, and see what others have done to theirs. Shine up your bonnet and hang a new pine tree scent from the rearview mirror. Or maybe just hide yesterdays Tribune under the seat, and come down to the show. Knauz MINI will be debuting the new MINI Convertible June 29th from 4-8pm and the CMMC will be there! There will be light refreshments on hand and possibly someone from MINIUSA there to answer specific questions. Let us know in the comments below if you plan to attend. Similar events will be happening at the other local dealers in Chicago but this will be the official debut! Who: Anybody with $60, and a helmet (no open wheel cars, convertibles need a roll bar). This is not an official CMMC event, but hopefully a handfull of people with the ability to take a Wednesday afternoon off will make the drive out there. I have heard that it is a beautiful track. If you are interested, please post here, or on the Michigan Club forum or send an e-mail to Chad from the Michigan Club. I would like to extend a big Thank you to the Michigan Mini Motoring Community for inviting our club!! For those MINI owners attending the US Grand Prix in Indianapolis on June 20th there are several events brought to you by the MINI Car Club of Indiana you won't want to miss. Personally I'll be heading down with a friend sometime around 9:00 am Saturday morning from Chicago. If anyone else is interested in joining us for the trip let me know! The car corral will be located on the backstretch of the oval again this year. You must have a grandstand ticket (cheapest is 75.00) or you can get a 3 day general admission pass for 60.00 (single race day GA tickets are not avail). You must also have a parking pass for the corral. To obtain the parking pass you need to call the IMS ticket office and identify yourself as a MINI car club member and tell them you would like to participate in the car corral. You will need your IMS ticket account number when you call. The ticket office number is 800-822-4639. Come join us on Saturday June 12th for a Detailing Tech Session at Emmons Coachworks from 11:00 am until about 2:00 pm. If anyone from the North Shore area is interested in meeting up to drive down to Villa Park, post here and we will plan a meeting spot.